Goodmans GHD8020F2 review | What Hi-Fi? The brains behind digital TV are currently pushing PVR recorders with their ‘Freeview Playback' campaign. Now, it's true there's no new technology behind the marketing, but don't let that spoil the message that ‘PVRs are fab!'. Unless you've used Sky+ or one of these Freeview PVRs you won't realise how easy they are to operate. Forget all that business of messing about in the past with VHS tapes, trying to set the timer correctly and then praying the tape won't run out two minutes before the end of your favourite programme. PVRs avoid all that and make recording ever so simple. The Goodmans is typical in that regard: it takes two or three minutes to set up, and choosing which programme to record is as easy as bringing up the on-screen Electronic Programme Guide (EPG), and clicking record. Its twin digital tuners mean you can record two things at once, or record one while watching another. his Goodmans model might be cheap, but it hits hard where it counts – picture quality. 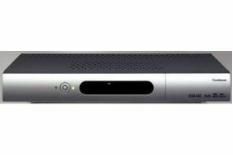 With a strong Freeview signal (it's best used with a roof-mounted aerial), pictures are detailed, colours are well balanced and motion handled with aplomb – even the Sky Sports News videprinter rattles along with panache. There's a hint of softness to faces, and sometimes a smidgeon of shimmer in background images, but nothing too serious to worry about. So does it have any weaknesses? Well, there's only an 80GB hard disk, and with some rival models boasting 250GB that seems a tad paltry. However, its 35-hour capacity should be sufficient for most users, most of the time. Build quality is good for the money, and the design is attractive in a simple, minimalist kind of way. This is a product that will slip unobtrusively under your TV and just get on with the job. Whichever way you look at it, the Goodmans is a bargain. It's ideal for adding to a non-Freeview TV or to replace an old VHS recorder. Alternatively, if you already have Freeview in the living room, you could add this to a kitchen or bedroom set. So, if you're in the market for an affordable, functional Freeview TV recorder, you need look no further.